Posted by Arun Rajagopal in Aviation, India, Marketing, Travel. One of the reasons I like Cochin International Airport (COK) is because of its large spaces. A lot of airports I have been to in India or in the Arabian Gulf region are bursting at the seams or are under a constant state of development. 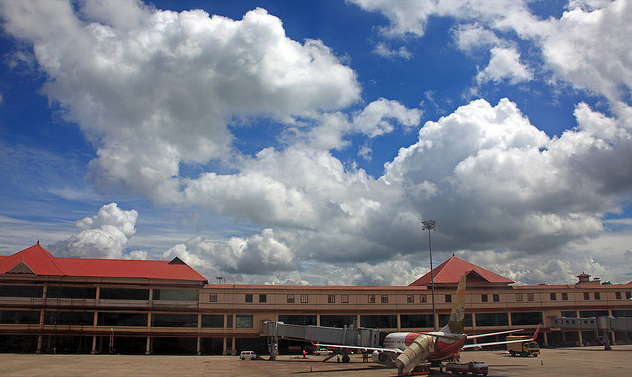 Opened in 1999, Cochin International Airport has all the whistles and bells of a modern airport. Larger spaces. Faster check-in. A great view of the tarmac from the gates. A reasonable duty-free selection. And the airbridges, which means no bumpy rides in the bus to the plane or no getting wet in the rains. And yes, a bookshop will be open soon. I’m told that the newly opened international terminal at Trivandrum (TRV) is catching up with Cochin and I can’t wait to check it out soon. I was recently traveling through Cochin and with a couple of hours to kill for my flight to Muscat, I chanced upon a register placed in a corner of the Departure Terminal under a board that said ‘Feedback on Airport Security’. I couldn’t help but glance through the feedback book and what I read is going to be the crux of this post. 1. Airport security needs be more friendly. Majority of the people complained about the cold, indifferent attitude of the airport security staff. Someone wrote: “The airport security should learn to speak proper English; English being the ‘national language’ of India.” I don’t know if the airport authorities can influence behavioral changes among the security staff. I think airport security is managed and run by CRPF, a central government agency whose functioning is outside the purview of the airport management’s control. But yes, there was almost universal criticism of their ‘customer service’ skills and their general approach to dealing with travellers. Now some of you may ask, shouldn’t their focus be on airport security than being nice to people in an age of heightened terror and security risks, but isn’t it better to have pleasant people skills no matter what your job. 2. Please smile, Mr. Immigration Officer. The immigration officials at the airport came under fire too. Someone had written – Can someone teach these people to smile? Or getting them to smile is like asking for the moon… something in that lines. Frequently traveling through airports in India, I know this is true. It doesn’t matter that the immigration official is probably one of the first people you come across in a new country, especially if you are a tourist. I have given up on all etiquette and polite manners when I submit my passport at Indian immigration. I give a cold stare and get a colder one back along with the stamped passport. On good days, I get the passport and boarding card flung at me. Oh why not, I’m being done a huge favor after all by this official who had to forgo his siesta at 6 in the morning to see the back of planeloads of travelers bound to the Arabian sands. This is where I admire the immigration officers at Muscat International Airport. They never forget to wish you, enquire your well-being and heartily welcome you to their country before stamping your passport. 3. “Can Cochin Airport have a dedicated smoker’s lounge?” What really impressed me about this request was not the request itself, but the sincerity and manner in which it was expressed. “More than 60% of travellers and tourists around the world are smokers and hence this airport should make convenient arrangements for smokers to light up in peace without going out of their minds and troubling fellow passengers.” A feedback suggestion that is always substantiated with a fact has a better chance of going through. (In this case, the ‘60%’ fact). 4. A gentleman requested for a separate prayer room for gents as well as ladies… fair enough. 5. A traveler to Houston made the brilliant observation regarding the absence of a single clock in the entire boarding gate area. True, there are giant screens showing flight schedules, but it would be wise to have the local time on them as well. 6. A tech-savvy traveler requested the airport authorities to provide passengers with Worldspace Radio… a couple of them demanded a better selection of TV channels on the airport TV. I guess Asianet or Surya is not everyone’s cup of tea. 7. One of the ultimate requests was by a couple of travellers who requested a bar in the terminal; nothing like a neat Scotch on the rocks before departure. Full marks to that. And no points for guessing that they were Malayalees. 8. Almost everyone complained about the lack of decent dining facilities in the departure terminal and the exorbitant price of tea & coffee. A cup of coffee costs 50 rupees. (A passenger wrote that the price of coffee was more scalding than the coffee itself). And COK Airport Coffee takes the crown as one of the ultimate listless coffees I have ever had the pleasure of drinking. 9. A passenger wrote about the how the drive-in entrance at the departures & arrival terminal wasn’t covered leading to travelers and their luggage getting drenched in the rains as they entered the terminal building. A very valid point; I came under the showers too as I was leaving COK that morning. Not a good experience to take off wet. 10. Hidesign has a swanky outlet at the airport. I hope they are making money. 11. Thought to end the post: I find liquor at Cochin Duty Free cheaper than Muscat Duty Free. And the last time I checked, they were giving a bottle free with every 2 bottles of Jack Daniel’s. For individuals, brands and organizations, feedback tells you what’s working right and what isn’t. Feedback is critical to customer service, product improvement, cost savings, productivity and work efficiency. 2. Feedback matters only when it is from the right person. So I worked on this snazzy looking marketing campaign. Getting suggestions on its look and feel from my peers isn’t as good a feedback from the customers of that product or service. 3. Use the right tools to collect Feedback. A complaint book at Cochin International Airport seems to a simple and old-fashioned method to collect feedback. But it is any day, a more effective and practical tool than a website form. The customer should find it convenient to share feedback and feedback collection should ideally happen at touch points where customers interact most with you. 4. Feedback should lead to action. Feedback is of no good if you don’t act upon it. Also, it helps to acknowledge that have you received feedback. To conclude, do enjoy this video of an Emirates B777 landing at Cochin. The CISF – Central Industrial Security Force (established in its present form: June 15, 1983) is a paramilitary premium security force in India is the one controls airport security at all commercial airports in India. Airport security, in the past, was under the control of the Airport Police (under the State Government). However, following the hijacking of Indian Airlines Flight 814 in 1999, the topic of handing over security of the airports to the CISF was first proposed. CRPF is Central Reserve Police Force, is a paramilitary security agency/Force functioning under the aegis of Ministry of Home Affairs(MHA), Government of India. The CRPF’s primary role lies in assisting the State/Union Territories in police operations to maintain law and order and contain insurgency. It came into existence as the Crown Representative’s Police on 27 July 1939. After Indian Independence, it became the Central Reserve Police Force on enactment of the CRPF Act on 28 December 1949.